This is a guest post from our friend Jenna Brandon at Writology. We were really excited to hear her thoughts about a perennially difficult task: measuring the ROI of your content marketing. Her advice is fantastic—be sure to give it a read! You’re taking off with content marketing. You know it works, and you know your story is huge. The game is on. You create stunning content, promote it, hire someone to manage your social channels. The first comments appear; people start following you on Twitter and sharing your posts on Facebook. It seems the content marketing machine is working. But how do you know the effort you put into the whole thing actually pays off? The truth is that it’s hard. Even marketing professionals with years of experience are constantly looking for new ways to measure content marketing ROI. In this article, you’ll learn about 10 tools to help you evaluate the success of your content marketing efforts. The most confusing thing about measuring the fruitfulness of your content is that it’s not always clear what you should measure. Is your campaign successful when it generates 1,500 new visitors? Or will you be satisfied only when you see a $10,000 paycheck? In fact, prior to plunging headlong into analytics, it’s wise to identify your goal. Do you want to measure content ROI (how much money you made)? Or content success (number of shares, likes, brand exposure)? Knowing what’s more important to you is crucial when it comes to assessing results. The metrics you need to look at will be completely different if you’re looking to grow sales or your primary aim is simply to get more people notice your brand. Content exposure: How many people saw your content? Look at traffic, social shares, and brand mentions. Content engagement: How engaging is your content? Do people like it? Measure clickthrough and bounce rates, time on page, scroll depth, and social engagement (including likes and shares). Search engine optimization (SEO): How does your content affect your Google rankings? Track your rankings, keywords, and links. Content conversion: How much money did you make thanks to this campaign? Assess your leads, sales, and subscriptions. There are a lot of tools out there that you can use to measure content marketing ROI. These ten, though, are a great place to start. If you have other suggestions, we’d love to hear them in the comments below! (Almost) every social media network has its very own built-in analytics tool that gives you accurate and detailed information concerning the popularity and reputation of your content. Such tools are free, but the information you get is priceless, especially if social media is a big part of your content marketing. 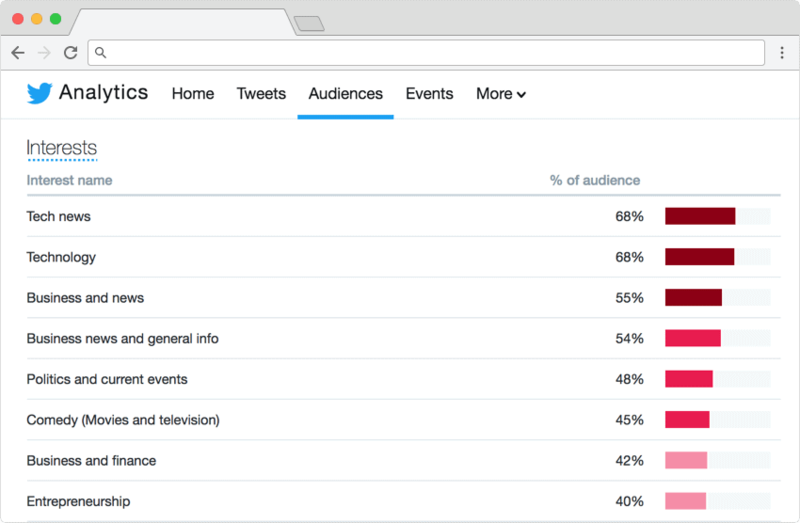 Twitter Analytics is an all-in-one tool that lets you see how your followers react to the content you share. You can track your overall monthly performance, analyze each tweet separately, and get insight into your followers. These statistics help you measure content marketing ROI on Twitter. If you’re losing people, it’s time to change something. Getting a detailed analysis of each tweet. Go to the Tweets tab to learn about your top tweets, engagement rate, and overall impressions. Audience insights. What interests your audience? What’s the education level of your followers? Are they primarily male or female? Do they like watching sports? Or maybe comedies? Twitter breaks it down for you, and that’s hugely valuable. Since Facebook is the biggest social network, it becomes even more important to know what works for your audience and what doesn’t. Like Twitter Analytics, Facebook Page Insights is a place where you can track how successful your campaign is and study your followers’ behavior. Measuring exposure and social engagement. The Likes, Reach, Page Visits, and Tab Visits panes will give you detailed information on the views, comments, and shares your posts gather. You’ll also see how many paid and organic likes you’ve received, which posts made people unlike your page, and where your fans are coming from (e.g., your website, Google, or other websites that linked to you). Understanding your fans. Facebook Page Insights will tell you when your followers are the most active (so you can post at the right time), who views your posts (men or women, older or younger), where they live, and which buttons they click more eagerly than others. Be sure to check the Actions on Page and People tabs. For more Information on how to use Facebook Page Insights, read this guide by Yoast. Do your viewers enjoy every minute of your video or do they click away after the first five seconds? Does your target audience even know about your channel? YouTube’s analytics tool can answer all your questions, provided you know how to read the graphs. Measuring exposure and engagement. Audience Retention, Engagement Reports, and Playback Locations will tell you all about how viewers receive your video content. Not only will you learn how many people clicked the play button, but also how many watched till the very end, commented, or shared your videos across other channels. Measuring time on page. The Watch Time tab shows you how long your viewers spend on your page actually watching your videos. Apart from that, you’ll learn at which minute they click away and what brought them to your channel (suggested videos, Google, or other sources). Hootsuite is basically Twitter, YouTube, Facebook Page, LinkedIn, and Instagram analytics combined in one application. It’s a perfect solution for those who find it rather inconvenient to check five different statistics tools to get an insight into what’s going on. Cost: Hootsuite’s free version has limited functionality and offers basic reports. The basic plan, which offers more complete analytics, is $9.99/month for one user. The price goes up to more than $100/month for big companies. 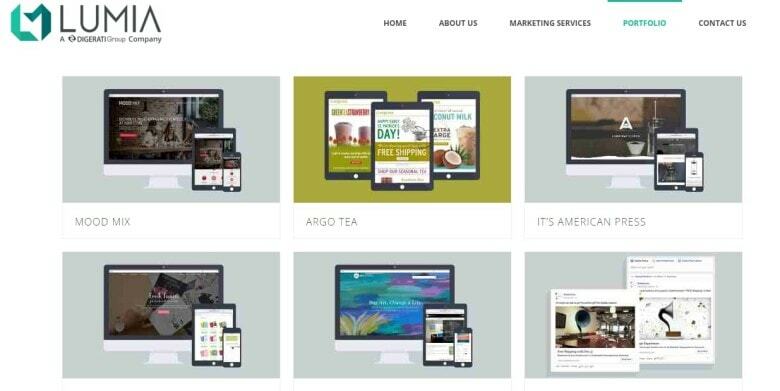 Prior to ordering a plan, you can sign up for a free trial and see if Hootsuite works for you. Measuring social engagement. You’ll learn all about views, likes, shares, comments, retweets, and new followers. 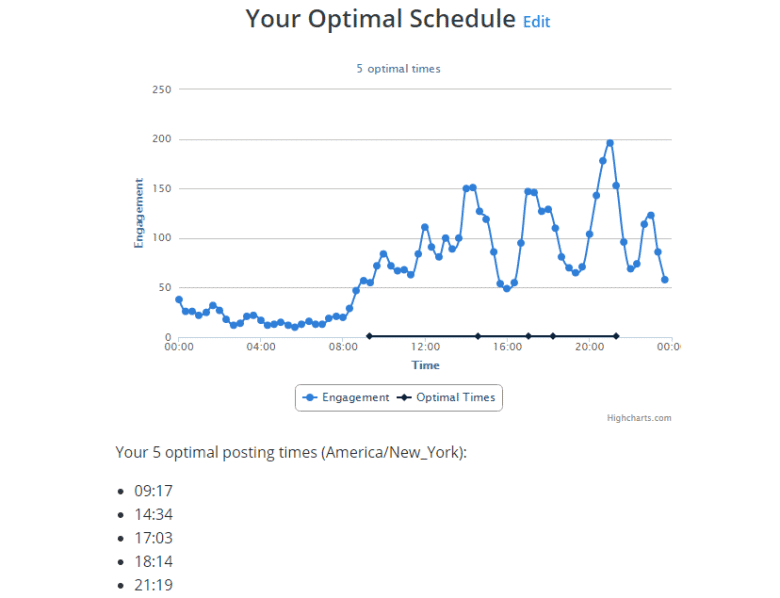 Hootsuite allows you to track social engagement real-time, so you can always stay updated. Tracking brand mentions. Just one click and you’ll get a nice graph displaying all the mentions of your brand within a given period of time. Manage your business connections and see how talked-about your brand is. HubSpot is a complex solution for online marketers that can do much more than provide analytics. It helps generate leads, increase sales, automate marketing, manage customers, and more. Since we’re talking about measuring content marketing ROI, though, we’ll skip the fancy features and focus on what matters for us. Price: After a one-month free trial, HubSpot will run you a whopping $200/month. Tracking SEO. HubSpot Marketing Analytics can identify blog articles, landing pages, emails, and social media posts that perform well in terms of specific keywords. It also looks at backlinks, an important factor in your search engine optimization. In other words, every piece of content you publish can be analyzed and you’ll know exactly how it affected your search engine rankings. Monitoring brand mentions. HubSpot’s Social Inbox is a tool that allows monitoring of brand mentions as well as hashtag and keyword mentions. Apart from freeing you from the chore of gathering this information manually, the feature gives you total control over your social media monitoring. Monitoring leads. Imagine that you have a full, detailed picture of your leads. You know where they come from, how they react to your content, which links they click and which they ignore. All that is possible with HubSpot. I’m pretty sure every content marketer breathed a sigh of relief when Buzzsumo was first introduced. It’s so ridiculously simple, yet so genius, that now it’s hard to imagine our lives without it. Though mainly used for finding influencers, you can still take advantage of several features when measuring how well your own content performs. Cost: You can try it for free, and even the trial version is quite functional. Prices start from $79/month. Measuring engagement. You can enter your domain name and find your best-performing content within a given period of time. You won’t see a list of web pages that get the most traffic, but rather the ones with the most shares. Monitoring links. With the View Backlinks feature, you can check all the backlinks to a particular piece of content. Tracking mentions. 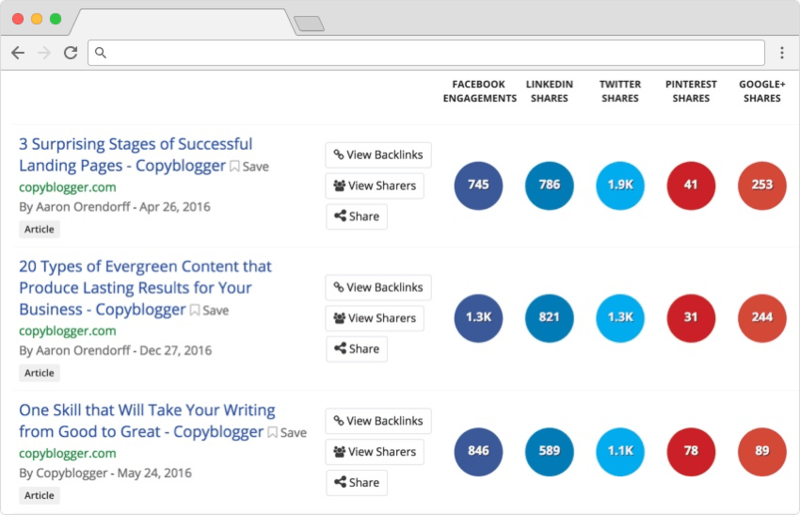 With BuzzSumo you can track brand mentions not only on social media, but all across the web. You can set up alerts and get notified every time your name (or any competitor’s name) is mentioned on the internet. Google Analytics is by far the most popular tool used by anybody who works with websites. It’s hard to find a service that can compete with Google Analytics in terms of price, data, and the number of features available. Price: That’s the best part about Google Analytics: it’s completely free. Measuring traffic. With Google Analytics, you’ll see daily visitor figures, your most popular pages, and where your traffic is coming from. This last feature is especially useful if you run email, guest post, or social media campaigns. Bounce rate. This is a good indicator of how engaging your content is. Use this information to figure out which pieces of content aren’t engaging your audience, and then improve your efforts with that information. Assess ROI statistics.how much each type of conversion is worth The ability to assign values to specific conversions in Google Analytics is hugely useful. 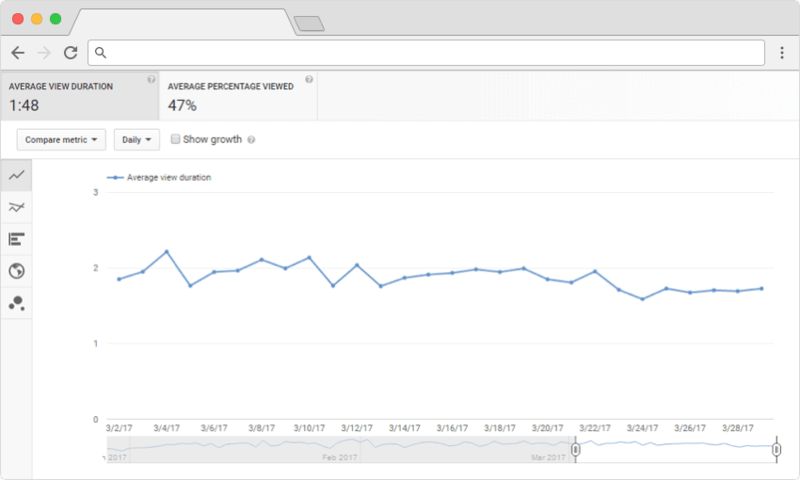 Figure out , add those values to your conversions in Google Analytics, and you have some compelling data to support your content marketing efforts. Hotjar is awesome. It basically records users’ sessions on your website. You can make yourself some tea or coffee, sit back, and watch a video of your visitors moving cursors, tapping, clicking, and scrolling through your pages. Though it may feel like you’re spying on customers, Hotjar lets you step in your visitors’ shoes and notice malfunctions, technical errors, and usability slips in order to fix them. Price: The basic plan that includes up to 2,000 pageviews a day is free. Paid plans range from $29/month to $589/month. There are free trials for each plan. Tracking time on page. Watch recordings and see how much time users spend reading your blogs or landing pages. Measuring scroll depth. If your content is engaging, visitors will scroll to savor every word of it. Use Hotjar’s scroll heatmaps to identify your best- and worst-performing content. Tracking conversions. Do you know exactly when your potential customers leave? Which pages and steps make them click away and opt for your competitor? Identify those barriers with Hotjar reports and take actions to improve conversion. 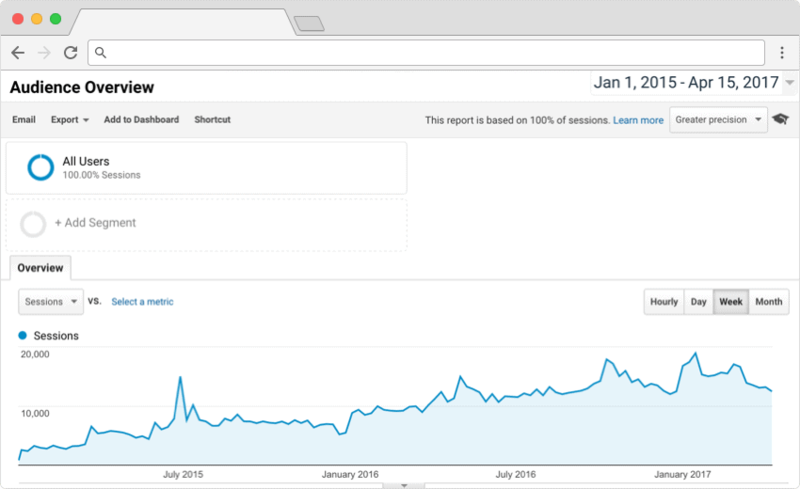 Kissmetrics can monitor your user’s behavior like Hotjar, generate leads like HubSpot, and track URLs like Google Analytics. What makes Kissmetrics special is its simplicity and focus on helping you build a unique product. Price: You can try it for free for 14 days. Then you’ll need to pay at least $220/month. If you need additional training on how to use the software, it’s another $600–1500! This is the priciest piece of software out there so far. That should give you an idea of its power. Measuring conversion. Kissmetrics will give you insight into how your marketing efforts translate into revenue. Do emails attract the highest-paying customers, or do most of them come from Facebook? Knowing this will help you determine which channels to focus on. SEMRush is one of the go-to tools for SEO specialists, and is trusted by millions of bloggers and digital marketers. Many use it for spying on competitors and monitoring their best keywords, backlinks, and ad campaigns. But it also offers numerous possibilities for tracking your own progress. Price: You can try it for free, with no strings attached—no phone numbers or credit cards are required. The cheapest paid plan is $99.95/month, and the most expensive is $399.95/month. Monitoring links and brand mentions. If anyone mentions your name online, you’ll know about it. Be it a blogger linking to your article or a customer posting a review, you won’t need to spend days and nights looking for mentions by yourself. Keeping track of keywords and Google rankings. With SEMRush you can check how your content helps your keyword rankings. 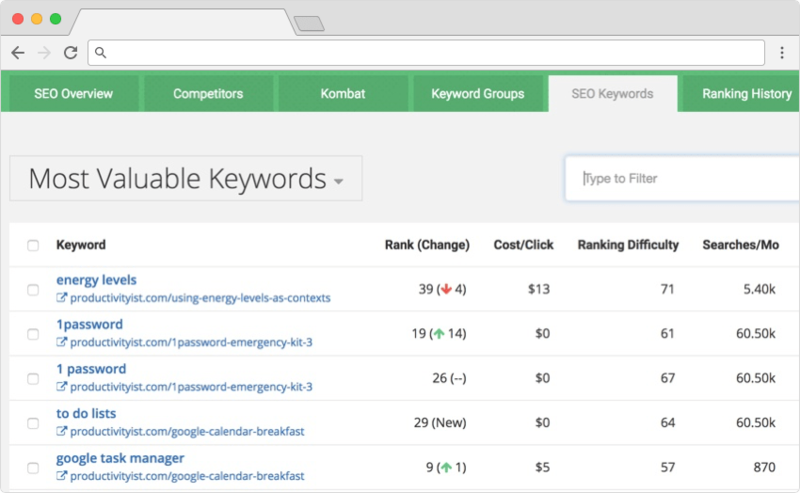 You can also use a keyword research tool to discover new keywords and get ideas for new content. Tracking traffic. Which pages on your website generate the most traffic? How much traffic from other websites or social networks comes to you? This helps you figure out which content you publish both drives the most visitors. From there, you can adjust your marketing campaign accordingly. SpyFu is quite similar to SEMRush. 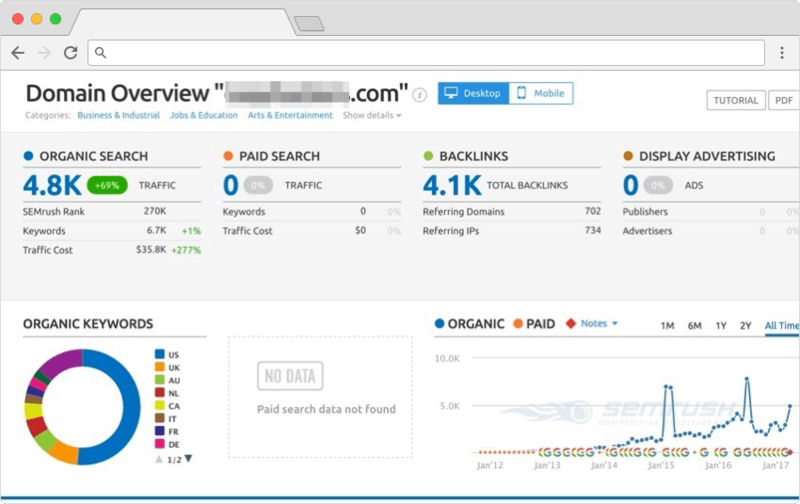 Though it’s designed primarily for SEO specialists, anyone can use it to track their competitor’s keywords, backlinks, and ads, as well as see how well your own website performs. Price: SpyFu has a really cool and (almost) fully functional trial version. Once you decide to subscribe for a plan, you’ll pay $44–$49/month for a basic plan and $199–$299 for a premium one. What sets SpyFu apart from other services is that you can pay month by month if you don’t want a full year of membership. Measuring keyword rankings. SpyFu gives you a full picture of which keywords are ranking well, which lost their positions, and which you should focus on. Tracking backlinks. Again, you can see who is linking to you (which tells you the content that earns the most attention). Remember, backlinks are great for SEO, so this is a good metric to track. Ahrefs can help you see how pages are performing against keyword rankings and backlinks, for both you and your competitors. Using Ahrefs’ content explorer, you can find new ideas based on the most shared and linked-to posts, rather than relying on your gut feeling. Price: The seven-day trial is $7. Monthly subscription plans start at $99. Content Targeting. With filters and advanced searches, you can find content around a specific topic. You can then narrow down your search by criteria like publish date, shares and organic traffic. Competitive Research. Look into competitors’ page performance, such as backlinks they earn, keywords they rank for and traffic they drive. You can also monitor their highs and lows over time. Keyword Targeting. Track your rankings in organic search and compare them with competitors’ results. See where you lag behind when it comes to keywords so you can make improvements. This tool is a cheaper alternative to giants like Majestic. It’s an easy-to-use backlink tracker that many use to keep an eye on competitors. It’s not an online tool; you actually have to download an app, but the result is worth it. Price: There’s a free version of the software with no expiration date. If you want more features, you can upgrade to a professional license, which is $124.75. An enterprise license will run you $299.75. You pay once and get a lifetime license. Tracking links. Since SEO SpyGlass is a backlink tracker, it gives you detailed information on your backlinks and their sources. You’ll know how valuable those links are, which ones drive the most traffic to your website, and even which ones harm your SEO and can lead to a ban from Google. Tracking social shares. You can monitor the growth or decline of your social signals for every webpage separately. How do you measure your own content marketing ROI? So, there you have it: a list of the top 10 content marketing ROI measurement tools. Obviously, there are dozens of other great apps and services that help marketers learn if their time and effort were wasted or not. And we want to hear which ones you’ve used, which you liked, and which didn’t impress you. Which content marketing ROI measurement tools have you been using? Which do you recommend? Are there some we should stay away from? Share your thoughts in the comments down below! Jenna Brandon is a blogger, copywriter, and digital marketer at Writology.com. When she’s not busy writing articles and studying marketing trends, she cooks pizza or goes hiking with her friends. Jenna is also an avid traveler, and she is secretly Italian at heart.